I’m always on the lookout for inspiration not only for my art work, but also for my booth display. 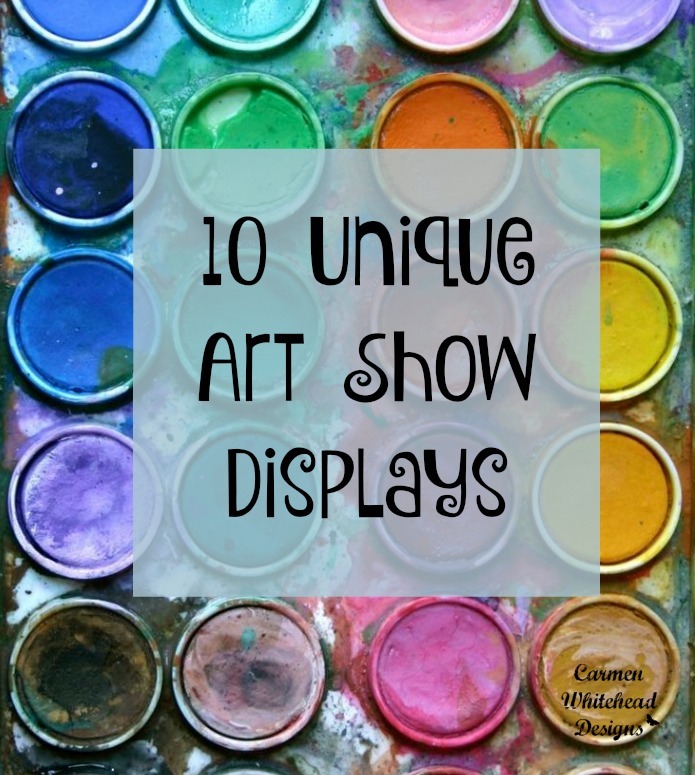 Especially on Pinterest I’ve found so many creative displays that I have put together a list of 10 unique art show displays to stretch your imagination a bit. 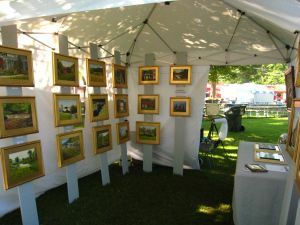 Having a professional, high-end art show booth like the one below can be very expensive, anywhere from $1,500 to $4,000. But, I am a frugal, DIY’er, upcycler and I have found some wonderfully creative and unique art booths that you can easily recreate. I love this faux wood flooring in this booth! It’s like walking into a gallery or museum. Marti McGinnis from Happy Art really has creating an inviting space and the overall look of her booth works beautifully with her art. 2. A fellow Arizonan, Regina Lord from Creative Kismet creates a wall of color on these grids. She does it so well, that you can barely see the grids. These are a very inexpensive way to create a large area to display and easy to break down and transport. 3. Reclaimed wood and wood pallets are so popular right now for upcycling projects and Joy Lyn Photography as done an incredible job of creating a wall display with lights. The washbin ties the whole look together too. 4. I love this vintage inspired display from Rhianna Wurman. Such an easy way to display cards and prints. I especially love the little vintage cup to hold her business cards. I created some similar displays that you can check out here. 5. What a unique twist on the standard easel with these made of branches. It gives the booth a cohesive look with the burlap wall draping and the theme of the paintings. 6. Doll Whiskers Art put these screen doors to work as display racks with some new chicken wire and “S” hooks. 7. If you have equal size artwork, this plank system is a good alternative. Simply paint some planks of wood, add some hooks and you’re good to go. Make sure you also secure them to the tent. 8. Narrow shelves hold prints by this tethered string for a clean and minimal look. 9. This simple booth has great impact with the string line and clothes pins. 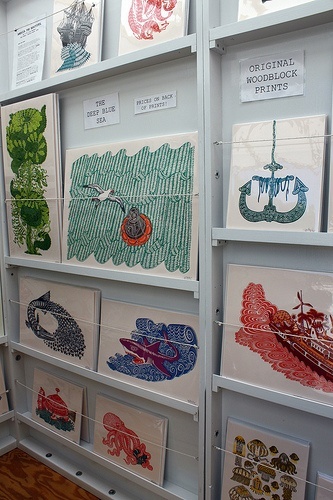 Great way to display a lot of prints if you don’t have very many originals or framed art. 10. If you only have a table space to work with, then use items to stack and elevate your work instead of spread out. Did you see some displays that you loved and want to recreate? Your booth is the first impression customers have of your brand, image and products. 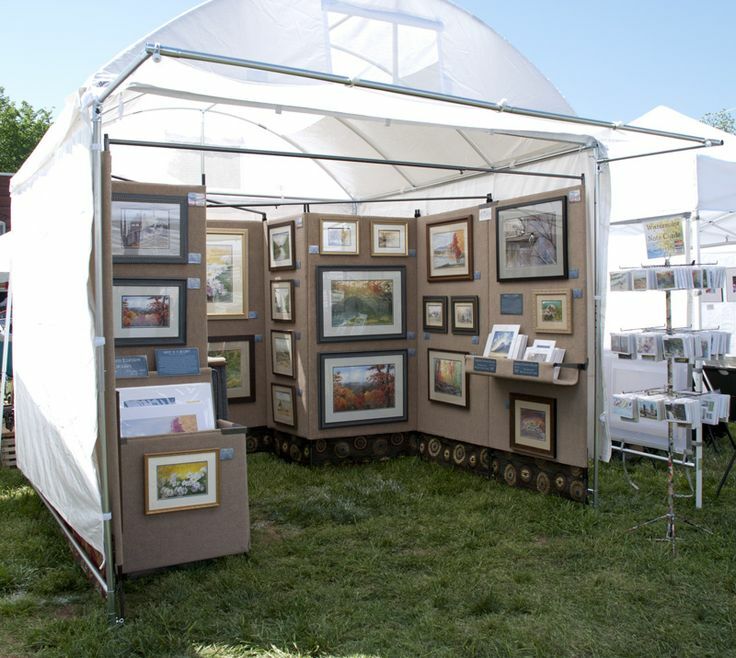 You don’t need to spend a lot of money to have a great looking booth display, but have a cohesive look between your art and the booth. If you want to see some more art booth displays you can check out my Pinterest board and for more art business resources, go here. The display booth is always a dilemma. Of course, I love the vintage looking one. I am going to sell with a friend at a vintage fair in Jan. We have got to figure out our displays. Live and learn, I guess. lol! Thanks for sharing with SYC. Carmen, it made me smile to see you included my booth–Doll Whiskers–in your blog! Thanks so much. The screen doors are always a customer conversation piece at festivals…they are somewhat lightweight, too, which matters a lot during set-up and break-down at shows.